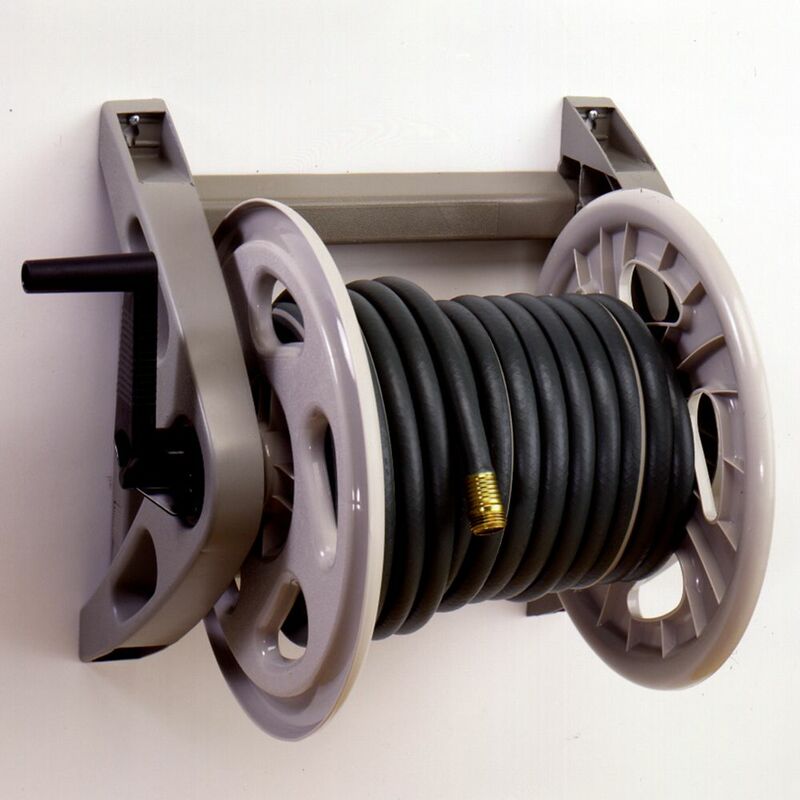 Suncast's Hose Handler hose reel provides convenient, wall mounted storage for your garden hose. Sturdy resin construction makes it durable and easy to maintain. Leader hose included. Hose capacity - 200' of 5/8"
Aluminum Wall-Mount Hose Reel. Made of Aluminum with an Antique Bronze finish. Holds up to 125 feet hose. New Rust-proof & Leak-proof aluminum die-cast water system with 2 position angle for leader hose. Convenient storage tray and soft-touch comfort grip. (Hose not included). Hose storage never looked so good. The NeverLeak. metal hose cabinet features the super-convenient Auto-Track. system that quickly and automatically distributes the hose evenly across the reel while rewinding. This metal deck box hose reel with wicker finish panels completely hides your hose for a clean patio. The NeverLeak. system also ensures that your water system won't leak, freeze, crack or corrode. This stylish and durable hose reel holds up to 100' of 5/8" hose. For smaller - to - medium sized gardens. For practical hose transportation and hose- sparing storage. Strong standing security through 3-pointside part connection. Ergonomic handle for easy transport. Angled hose connection prevents kinking of hose. Hose Handler 200 ft. Capacity Hose Reel Suncast's Hose Handler hose reel provides convenient, wall mounted storage for your garden hose. Sturdy resin construction makes it durable and easy to maintain. Leader hose included. Hose Handler 200 ft. Capacity Hose Reel is rated 3.3 out of 5 by 3. Rated 4 out of 5 by Satisfied from Replacement unit. This is a replacement reel for one of the almost exact replica that I have had for 20 years. The old unit has sat outside in the sun throughout the years. I just removed the hose for the winter. The outside reels had seperated over the years and the unit was falling apart. Possibly from overloading it with 200 feet of 5/8" hose. After assembling the unit, which was fairly easy, I put some "Goop" on the seams where the parts connected . This is probably not necessary but I want to get 40 years out of this one. The old one didn't owe me anything and I had no hesitation in ordering another one. This unit represents good value and performance. Rated 5 out of 5 by OMOTB from An exact replacement Assembly instructions could have been a bit clearer but that said my last identical hose reel lasted for many years and was happy to get an exact replacement.